My involvement in the development of collaborative practice continually challenges me to find frames of reference that will help me move forward in my understanding of this extra-ordinary phenomenon – that is the on-going attempt to integrate the wisdom and practice of 3 discrete disciplines, the people who practice them, and the endless variety and complexity of todays’ families. To embrace such a broad spectrum of concerns and experiences takes an increasingly wide lens. This article is a very brief overview of one the most all-encompassing and useful models I have found to date – Ken Wilbur’s A Theory of Everything. And true to his title, I have not yet found any aspect of collaborative practice that I cannot fit into his model. I have found A Theory of Everything (also known as the Integral Approach) very useful in helping me sort through my experiences as a participant in the Collaborative Practice movement. It helps me find a place for these experiences within a coherent whole that then allows me to understand where progress is taking place and where something is stuck; be it within me, my practice group, or at the international level. It is my opinion that our involvement in this movement challenges all of us on many levels almost all the time. 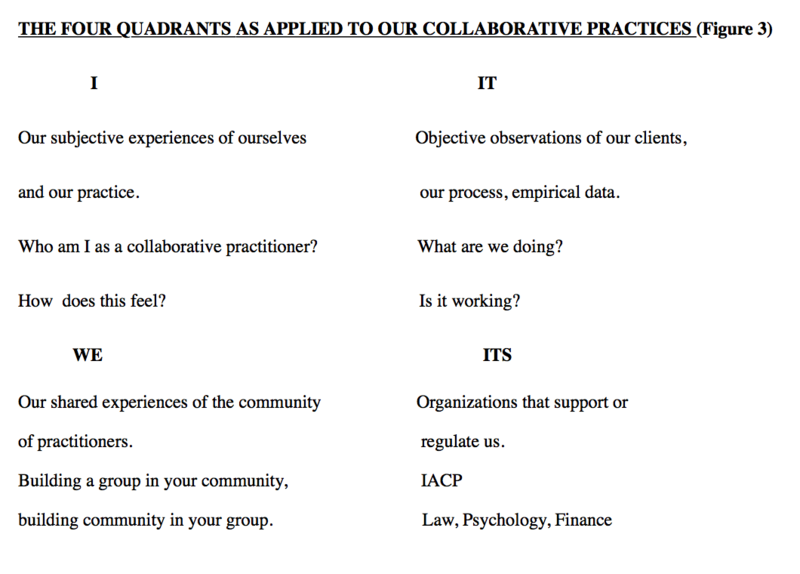 This model also allows me to understand the terribly important role that IACP plays in the development of Collaborative Practice. 1. Wilbur’s first assumption is that we evolve. Societies evolve. Although it may seem that the pace is slow or that at times we see no movement at all or worse, feel we are going backward, we are indeed moving forward. I recently heard of an organization here in Vancouver whose motto is “Resolve to Evolve”. 2. Second, not all ideas are equal. While all ideas have some merit, not all ideas are equal. Some ideas create profound shifts. They change how we see things in such a way that once we are exposed to them, we cannot go back to how we saw things before. For example, some say that the most important thing that came from NASA’s early trips to the moon was the image of the earth as seen from space. It changed how we saw ourselves forever. 3. Evolution is a spiral. A new idea begins a new and better cycle. This happens because a new idea covers the same ground but in new, improved way. This new improved way allows advancement and evolution in all areas. 4. At each new level, all previous information/ideas are included. The process of change is the process of the integration of what was before with what is new. Nothing is lost. Equally, integration does not homogenize or flatten differences. Moving forward is not reducing the field to our favorite part. Wilbur divides experience into four quadrants. (Still another name for this approach is the 4-quadrant approach). This is simply the combination of four basic orientations: personal/subjective, outer/objective, individual/singular and plural/collective. (See figure 1.) The two upper quadrants are individual or singular and the two lower quadrants are plural or collective. 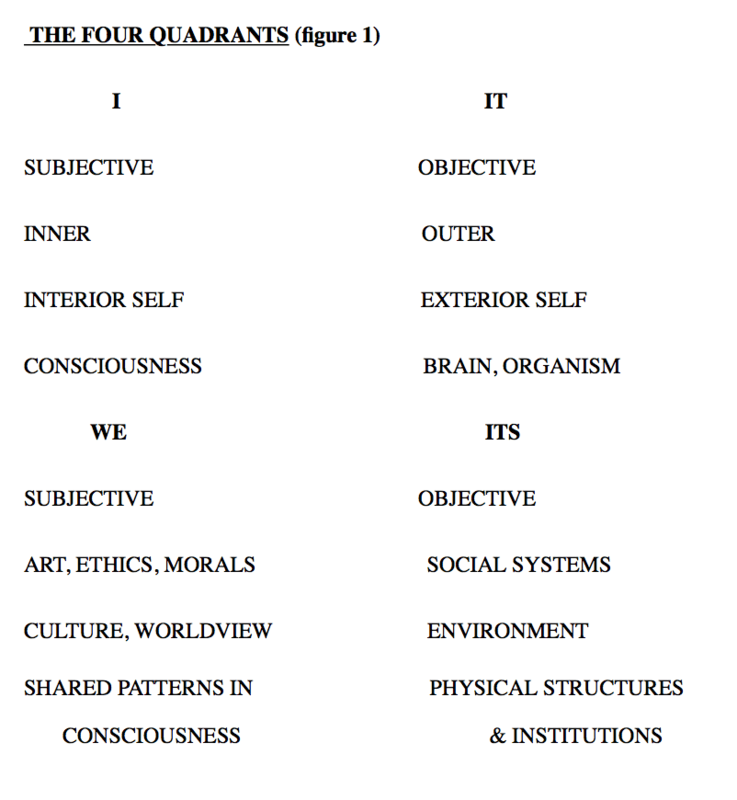 The two left hand quadrants are subjective and the two right hand quadrants are objective. The upper left quadrant includes our direct individual subjective experiences. Our experience of our own senses, thoughts, feelings, physical sensations – everything that goes into our individual experience of consciousness. The lower left quadrant describes our collective inner experiences – those inner experiences that relate or involve another person or people such as relationships, cultural connections, morals and ethics, patterns of consciousness that make up a community. The upper right quadrant includes exterior or objective information – data, information from tools, measurements, science. The lower right quadrant includes organizations – social systems, physical structures and institutions. Wilbur suggests that for change to occur, all quadrants must be involved. In order to move forward, all quadrants must be active. Any quadrant NOT involved will limit progress. More on this later. How does this relate to Collaborative Practice? You may have your own interpretation of things, but this is how I see it. Stu’s experience of “I quit” fits into the upper right or individual subjective quadrant. (See figure 2.) Into this quadrant I also put the individual experiences of each founding member of the Collaborative Divorce group. These inner experiences motivated them to act. These inner experiences lead to actions (upper right quadrant); Stu’s “I quit” behaviors and the behaviors of the founding members of the CD group. These were external, and observable. Others saw what these visionaries were doing (upper right), had an inner experiences of resonance (upper left) and joined them to create the beginnings of the collaborative practice community (lower left). Many relationships were formed and small groups began to spring up all over (lower right). 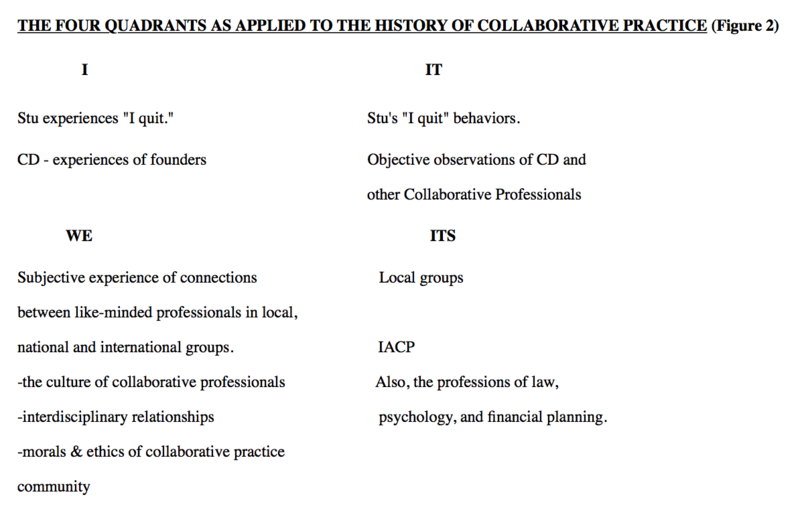 And finally, (thank goodness) IACP was formed (lower right), providing an institution to support the growth of Collaborative Practice internationally. With all four quadrants activated the spiral of the evolution of collaborative practice began to move to greater levels of integration. Within the structure of the Integral Model, we can find a place for all aspects of our experiences within Collaborative Practice. (See figure 3.) As we attempt to discuss concerns, we can use this structure to organize our experiences and observations. Once organized, it is much easier to identify what we need and to imagine possible solutions that will move us forward. The upper right quadrant includes our direct observations of our clients, of each other, of the process. It also includes empirical data – How many cases are going on? How much does it cost? What are clients saying about the process? Is it working? How can we assess outcomes? Clearly we have a lot to do in this area. Dr Julie McFarlane of the University of Windsor has started us off, but there is much more we need to do in this quadrant in order for the absence of information not to limit our progress. The first IACP research committee has been struck with Dr Rodney Nurse as chair, to support research in Collaborative Practice. The lower left quadrant; building a group in your community, building community in your group. Collaborative practice communities now exist all across Canada and the US, with more groups starting in England, Ireland, Austria, Australia, New Zealand, and more. Once the groups are formed, a community of practitioners can develop that supports us as we do this work. Group members can teach each other from their disciplines thereby raising the level of sophistication of the group. These over-lapping relationships create a work environment that can handle difficult cases and provide us with a place to process our own experiences (upper left). And last but not least, the lower right quadrant is home to IACP, our umbrella organization that provides us with supportive structures; a mission statement and vision, the annual networking forum, the Collaborative Review that you are currently reading, gorgeous marketing materials, the website and many more pieces in progress and yet to come. According to Ken Wilbur, if we did not have IACP, our progress would be substantially hindered by its absence, and as a board member of IACP, I believe him. The lower right quadrant also includes the disciplines and institutions of law, psychology, family therapy, finance, child development, mediation etc. As collaborative Practice evolves, we will take this experience back to our professional organizations and they will be informed by it. As I consider the various professions involved in Collaborative Practice, this model helps me see where our respective strong suits are, and where our work can be greatly enhanced by the other professions. While one could argue that each profession is active in each quadrant, I think it is also clear that each profession has a focus and as professionals in these domains we have preferences and comfort zones that do tend to cluster in particular quadrants. We have all witnessed the distress of families going through separations (upper right). We are all aware of the relevant literatures on the effects of separation and divorce on families (upper right). Law tends to focus more on the right quadrants. These quadrants include external/observable behaviors for the individual (upper right) or the group (lower right). Law also develops skill sets that are excellent for developing group structures and organizations (lower right). This helps me understand how lawyer-only groups sprang up so quickly across Canada and the US. Psychotherapy includes an intense focus on the left quadrants. This includes the experiential aspects of both the clients and the therapists (upper left). Family therapy focuses on the experiential aspects of couple and family relationships (lower left). Theories of family therapy have also been taken to the work place however they still focus on the inner experience rather than the organizational structure. As far as I can see, the work of the financial specialist seems to focus on the upper right, the observable financial situation of the client. Even though we must all understand our clients and be able to communicate with them effectively, the focus of the financial specialist appears to be the external, observable commodity of finances. From this model I can clearly see the power of bringing these various parts together in the service of clients. Each part has a different focus, yet together we cover all the quadrants. Equally, I can see why it is so difficult. We are essentially crossing over into completely different aspects of experience; typically the aspects we are not strong in. No wonder it is uncomfortable. As we struggle to learn more about each other we are not coming from our strong suit. Quite the contrary. We are forced to go out of our comfort zone into those domains we have been avoiding since high school. And thank goodness for IACP! What an accomplishment to have created an organization that can house us all, and support us in this practice. At this point I must take my hat off to those board members who came before me and who had the vision, tenacity and sheer audacity to believe that such an organization could actually exist, never mind grow at such a rapid rate. So, according to Ken Wilbur we have all we need to evolve. We can ‘resolve to evolve’. With strong representation in all four quadrants, we are indeed moving forward quickly, getting more and more sophisticated in our discourse and our practice. Where do we need to focus now? In my opinion, we need solid research on client outcomes, costs, and what exactly are people doing. We need more mental health practitioners to take on leadership roles locally and in IACP. We need the lawyers to feel more comfortable with the left quadrants – the experiential side. I’m not so certain what we need the financial specialists to do but I’m sure there is something. Finally, we need to appreciate ourselves for all the effort, compassion, and hard work we bring to this process. It is indeed extra-ordinary. And I feel so very fortunate (that’s upper left) to be a part of such an adventure. I can hardly wait to see where another few cycles around the spiral will take us. Wilber, Ken, (2001). A Theory of Everything. Boston, Shambhala Publications. Wilbur describes Integral Medicine, Integral Education, Integral Business, Integral Ecology, and describes the integral process implemented by UNICEF. I like to think that perhaps we are in the process of building Intregral Law – but I will leave this up to Mr. Wilbur. If you don’t believe me, take a look at the last 500 years of parenting practices. Personally, I found this very convincing. Wilbur acknowledges that this is counter to brain activity and agrees he would have reversed right and left sides of the model if he had been thinking of that at the time. I guess he was busy thinking of everything else at the time.